Since I put this page up, both Lucky and his brother, Starr Blue have passed from HCM. Because I had the insurance, I was able to have the best care for Starr. Since his symptoms did not present immediately as HCM symptoms, we ran a bunch of tests on him, and I would do it again. Without the help, between the emergency vet, the tests, the euthanasia, the cremation, the urn, everything the bill totaled almost $3000. About $2100 has now been covered by insurance. PLEASE insure your cats. I would not have had all the money to cover it that day and this way I was able to make sure I knew it was (mostly) his heart and to make the decision to let him go. I'm putting copies of my cats policies here, a lot of people are overwhelmed, and it's not hard at all. You can see when I started out with Daisy, I had only chosen a $2,500 Per-Incedent limit with a $100 per Incident deductible. That ran out on her feet last year, she is now 8 years old. I changed it up a little as I got each new cat, and when I got North, after Starr was diagnosed, I chose the highest limits I could. When Starr was alive, I paid $141.00 a month for ALL FIVE CATS TOTAL. That's $1,692.00 a year to cover all Five Cats. Each of Starr's heart scans were about $600.00 and they were almost fully covered. 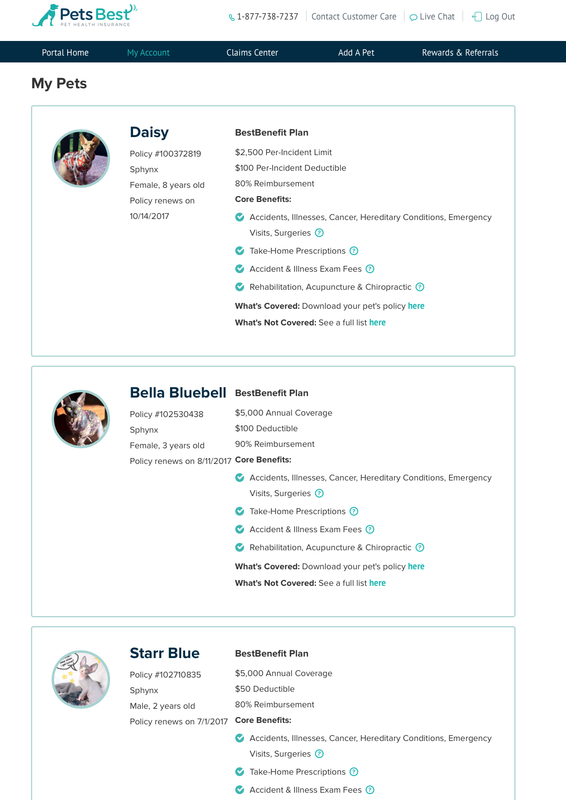 Daisy's medications - $1400 a year. Almost fully covered. General colds, eye mishaps, poop problems. Almost fully covered. So they paid almost all of my pet bills above and beyond what I paid in to them. Instead of putting all the vet bills on a credit card and paying it off, plus interest, I paid for their health insurance each month. By the time the year was up, I had gotten more money back than I had paid in. Sometimes I had to pay vet bills with a credit card until I got reimbursed. Sometimes I had to pay late. But I paid. They do direct deposit into my bank account. ​Really, really think about it. It's month to month, you get a multi pet discount, and they have wonderful customer service. Most vet hospitals submit the claim for you, and you can also take a photo of your claim and upload it, that easy. If you do nothing else today, go sign up, you can always cancel. You can do all the research you want to knowing your baby is covered for accidents in 3-4 days and for illness after 10 days after you sign up. They don't do pre existing conditions, they may request records. It's ok, that's normal.